Now we know how the signals and slots are used in the Qt programming domain. Next step is to connect the QML front-end to the C++ back-end so that we can do our heavy number crunching in the C++ side. 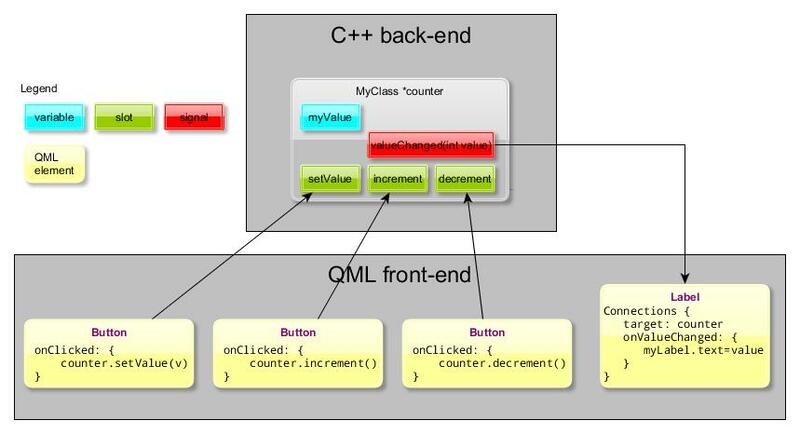 The communication should be bidirectional so that we can pass data from the QML side to the C++ back-end and vice versa. In the C++ classes we can add slots and signals as described in my previous post. If we create a context property for each object we can then access the slots and signals from the QML elements. 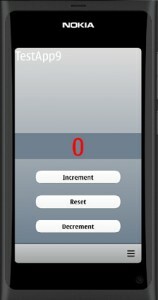 Let’s create a simple counter application with a QML user interface. The application structure is depicted in the figure below. In the C++ side we will create one simple class (MyClass) that contains 3 slots (setValue, increment, decrement) and one signal (valueChanged). 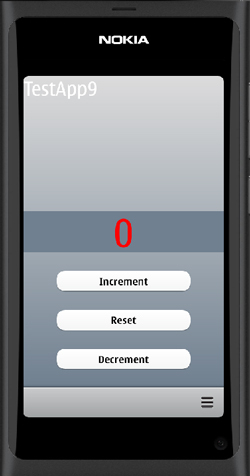 In the QML side we will add 3 buttons that will call the slot methods when clicked. In addition we will add one label that will display the counter value (stored in the myValue variable in the MyClass object). Here is the MyClass declaration (in myclass.h). Note that the signal valueChanged has one named argument (int value). If we want to pass some data with the emitted signal to the QML side then we must name the argument in the signal prototype declaration (this was not needed when connecting to another C++ class instance). In the QML element we must refer to this argument name when reading the data from the signal. The MyClass implementation (myclass.cpp) is shown below. Here we will just define the slot methods (+ the class constructor). Each slot method will emit the valueChanged signal to display the counter value. The main program is pretty basic. We will instantiate MyClass and then add the object pointer (counter) to the root context (naming the property also to “counter”). Finally we will call the setValue method to initialize the counter to 0 (the constructor set the value to -1). This ensures that we will get the first signal emitted at this point and the display will be initialized, too. Ok, next the QML code. The main.qml file is just the normal template given by the Qt Quick Application project. target = the signal source object (the context property “counter” in this case). event name = on<SignalName> (“onValueChanged” in this case). Note that we must capitalize the first letter of the signal name when adding the “on” prefix. And also note that we can refer to the signal parameter by using the formal parameter name (“value”) defined in the signal prototype in myclass.h. Let’s compile and run the application. The counter will start at zero. By clicking the “Increment” and “Decrement” buttons the counter value can be changed. By clicking the “Reset” button the value will be set back to zero.